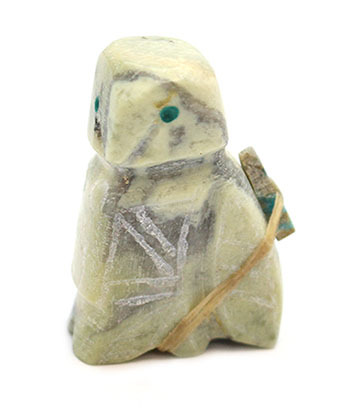 This owl fetish is carved out of green serpentine with a turquoise arrowhead pack. It stands about 1 1/4" tall, about 7/8" long and about 3/8" wide. Carved by Zuni artisan Gabriel Burns. Currently only this one available. © 2019 Thunderbird Jewelry Co. Inc.